‘UFO’is a peach variety with a low winter chilling requirement of approximately 250 chill units (cu). Trees of ‘UFO’ are of large size and highly vigorous with a semi-upright growth habit. Trees of ‘UFO’ regularly bear heavy annual crops of fruit which are large for the moderately early ripening season. Fruit of ‘UFO’ are very firm with a yellow, non-melting flesh which are semi-freestone and of peento shape. Fruit of ‘UFO’ are uniform and substantially symmetrical in shape and have an attractive 50 to 70% striped red skin color and a diameter of 2.5 inches. 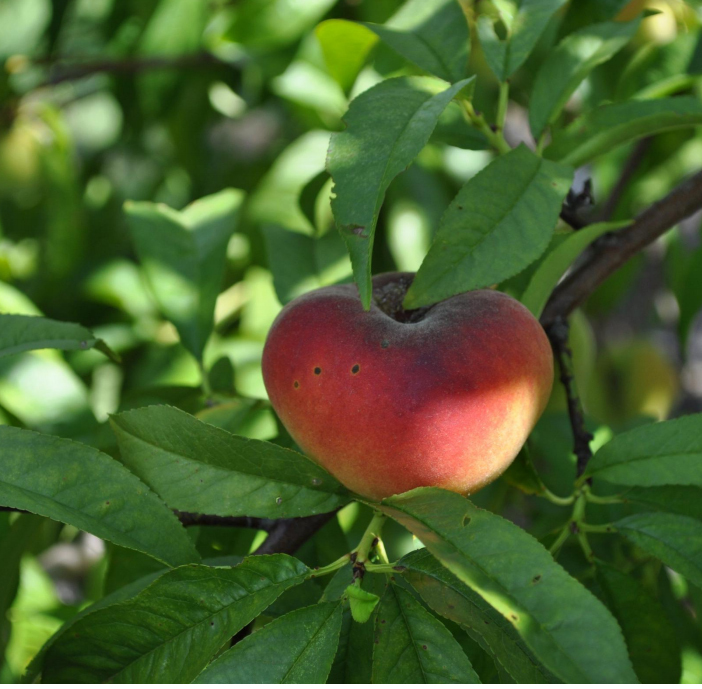 The fruit of ‘UFO’ ripens ten (10) to fifteen (15) days after that of ‘UFGold’ peach in mid-to-late May in Gainesville, Florida.